The photographs of mountain landscapes on these pages are not the casualties of ever increasing entropy (erosion), but rather the survivors of an inexorable process dictated by the second law of thermodynamics that moves all things physical toward higher states of entropy with the passage of time. Such mountains stand tall and proud, unyielding to the endless tortures of wind and rain, snow and ice, unmindful of the relentless freezing and thawing of the seasons. Contemptuous of the might of men, they remain unbowed, magnificent, and majestic for all to enjoy and appreciate. Though they are much older than humans, we are both the result of eons of evolution; enduring the abuse and enjoying the benefits of many millions of years of random destruction and creation to become what we are now, survivors on an evolutionary journey that is still unfolding. Though our paths are very different, the process is the same, and thus, there are lessons we can learn from the wisdom of the ancient mountains. As it becomes increasingly clear, we are all interconnected in fundamental ways which we are just beginning to understand – all joined as one living small blue planet. 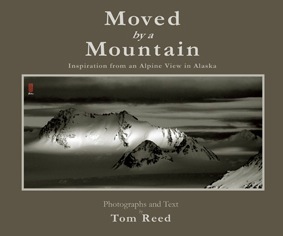 The majestic landscapes depicted by Reed’s photographs remind us of our comparative smallness and insignificance. Simultaneously, we can identify with the persistence and enduring power exhibited by these wild monuments of nature. As Reed discovers in his account of living in the presence of The Throneroom, we can become mentally, emotionally and spiritually entangled with these mountains in a profound way, and the result will resonate with our core as a perfect meditation of being whole and complete in the moment. In that identification of oneness with the mountains, we can begin to realize that we are a part of what is real, and sacred, and grand in the big picture, as well as what is small, profane, and dysfunctional in the little picture–that we too are a piece of something beautiful; a work of natural art that is shaped in the little picture by cycles of birth, choice, and decay. Through observing the resistance of The Throneroom, Reed awakens to an awareness of the continual struggle against the tide of increasing entropy; that human beings are also in the process of forming something majestic that is bigger than ourselves. The hope of our species is that our boundless collective and individual potential will one day develop its own expression of beauty and perfection that will be no less a majestic part of this world’s landscape than the mountains in these photographs. From our perspective, these wild and dangerous places are metaphors for the invincible, powerful, adaptable, and immortal – all things that we, as puny physical beings, are not. Yet, surprisingly, they are good metaphors for “we the people” who collectively animate the form of an evolving humanity that has few limits placed on what it might become. Moved by a Mountain reminds us that we, like the mountains, face the challenge to persist and endure until we become a thing of peace and beauty. Love is our destination, and the mountains show us our path and urge us on to be all that we have the potential to become. As we look at these dramatic photographs of The Throneroom, we get a momentary taste of our immortality as conscious beings…a challenge to evolve and become, to persist and grow, as both individuals and members of a race with nearly unlimited potential. Gazing at these photographs, we can sense the awesome power of natural existence, the challenge and uncertainty of a dangerous environment, and the immortality granted by evolution that subsumes the individual. This state allows us a healing and helpful glimpse of a bigger picture that puts our individuality in perspective as a part of something larger, more lasting, and more significant. Thus the mountains speak truth to us. If we listen, we can resonate with their message at the core of our being. They inspire us, and in doing so become beautiful in ways we deeply understand but cannot express at the more shallow intellectual level of facts and models of human behavior. 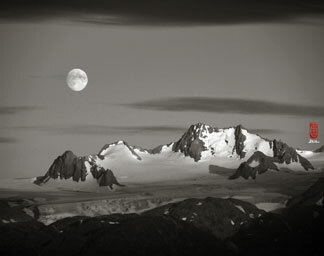 These wild places and high peaks put us in touch with our own power and purpose; we see our own potential in their images and find healing and peace in their encouragement to join with Gaia and all of her creations to become all that we can be, a necessary step toward actualizing the potential of the whole. They nudge us onward to find our destiny as they have found theirs; our destiny, an expression of natural love, encouraged and focused by their destiny, an expression of natural beauty. Only together can we succeed for, in truth, we are but one. « Will AWE Allow Us to Shift?